Economic and financial crises have become perennial features of today’s global economy. Macroeconomic theories of crisis, including the global crisis that unfolded in 2008, emphasize the role of financial deregulation; capital flow imbalances; and growing debt, fueled by income and wealth inequality. These approaches tend to be divorced from feminist thinking which analyzes broader distributional dynamics transmitted through structural channels and government policy responses, with an emphasis on gender, race, class and ethnicity. 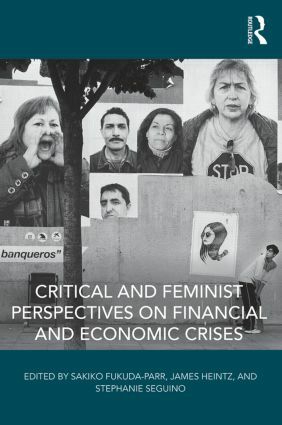 This volume brings together innovative thinking from heterodox macroeconomists and feminist economists to explore the causes, consequences, and ramifications of economic crises. By doing so, it highlights aspects of the economy that are frequently overlooked or ignored, such as the impact of crises on the vast amount of unpaid work which women perform relative to men. The collection of international studies assembled here takes an innovative approach to analyzing a range of issues, from the subprime mortgage crisis to the gendered effects of austerity to the role of the International Monetary Fund in governing an unstable global economy. In so doing, it looks beyond causes and consequences and points to new directions for macroeconomic and financial policy. This book was originally published as a special issue of Feminist Economics. 5. Economic Recession and Recovery in the UK: What’s Gender Got to Do with It? Sakiko Fukuda-Parr is Professor of International Affairs at The New School, New York City, USA. She is a development economist interested in human development and capabilities and the broad question of national and international policy strategies. James Heintz is Professor of Economics at the University of Massachusetts, Amherst, USA. He has written on a wide range of economic policy issues, including job creation, global labour standards, the distributive consequences of macroeconomic policies, and human rights. Stephanie Seguino is Professor of Economics at the University of Vermont, USA. Her research explores the relationship between the macroeconomy and intergroup inequality by class, race, and gender. That work includes analyses of the effects of monetary policy and austerity on gender and racial inequality.